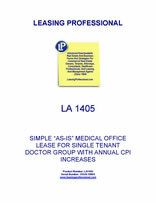 This Lease (“Lease”) is made as of _________________, by and between COMMERCIAL MEDICAL PROPERTY LANDLORD, INC., a __________________ corporation (“Landlord”), and AGREEABLE MEDICAL TENANT, INC., a _________________ corporation (“Tenant”). 1.1 TERM. The term of this lease shall commence on the date of this Agreement set forth above (the "Commencement Date") and shall expire on __________, unless sooner terminated pursuant to the provisions hereof. 1.2 POSSESSION. Tenant's right to possession and obligations under the lease shall commence on the Commencement Date. 2.1 BASIC RENT. Beginning on the Commencement Date, Tenant shall pay Basic Rent to Landlord of $__________ per month. If the CPI published for the third (3rd) month prior to the Adjustment Date (the "Extension Index" or "EI") has increased over the CPI published for the third (3rd) month prior to the Commencement Date (the "Beginning Index" or "BI"), the Monthly Basic Rent payable during the ensuing year (the "Adjusted Monthly Basic Rent" or "AMBR") and until the next Adjustment shall be computed by adding to the Monthly Basic Rent set forth in Section 4.01 hereof ("MBR") the product obtained by multiplying said Monthly Basic Rent by the Percentage by which the Extension Index has increased over the Beginning Index. In making such calculations, no effect shall be given to existing rent concessions or abatements (if any). CPI shall mean the Consumer Price Index for All Urban Consumers (CPI-U) published by the Bureau of Labor Statistics of the United States Department of Labor, for the U.S. City Average, All Items (1982- 84=100). If a CPI is not published for the third (3rd) month prior to the Commencement Date and/or the Adjustment Date, the CPI for the next preceding month for which a CPI is published shall be used to determine the Extension Index and/or Beginning Index, respectively. If the CPI is discontinued or revised during the term of this Lease Agreement, Landlord shall designate a successor index and make such adjustments thereto as it considers appropriate in order to obtain substantially the same result as would be obtained if the CPI had not been discontinued or revised. Notwithstanding anything above to the contrary, in no event shall the Monthly Basic Rent payable by Tenant at any time during the term of this Lease Agreement to be decreased as a result of the Adjustment provided for in this Section. 2.3 ADDITIONAL RENT. All taxes, insurance costs, utility charges, repairs and maintenance and any other sum which Tenant is required to pay to Landlord or third parties shall be additional rent. 2.4 LATE CHARGE. If any portion of the basic rent remains unpaid for ten (10) or more calendar days after the date on which such amount is due, Tenant shall pay to Landlord a late charge in an amount equal to five percent (5%) of such delinquent payment. Tenant agrees that such amount is a reasonable estimate of Landlord's collection and administrative expenses. 3.1 PERMITTED USE. The premises shall be used for medical office purposes and uses related thereto, but for no other purpose without the prior written consent of Landlord, which consent shall not be unreasonably withheld or delayed. (a) Conform to all applicable laws and regulations of any public authority affecting the premises and correct at Tenant's own expense any failure of compliance created through Tenant's fault or by reason of Tenant's use. (b) Refrain from any use which would be reasonably offensive to other tenants or owners or users of neighboring premises or which would tend to create a nuisance or damage the reputation of the premises. 4.1 LANDLORD'S OBLIGATIONS. The premises are being leased in an "as is" condition and Landlord shall not be liable for repairs or maintenance of the premises or other charges, except for replacement and maintenance of the roof, exterior walls (excluding painting), bearing walls, structural members and foundation. (a) Repair of sidewalks, driveways, curbs and parking areas. (b) Repair and maintenance of water, sewage, gas and electrical services. (c) Repair of the heating and air conditioning system, including ordinary maintenance. (d) Repair of interior walls, ceilings, doors and windows and related hardware, light fixtures, switches, and wiring and plumbing. (e) Maintain the exterior and interior of the premises in good condition. (f) Any repairs (including those for which Landlord would otherwise be responsible pursuant to section 4.1) necessitated by the negligence of Tenant, its agents, employees, and invitees. (g) Any repairs or alterations required under Tenant's obligation to comply with laws and regulations as set forth in 4.2(a) above. 4.3 REIMBURSEMENT FOR REPAIRS ASSUMED. If Tenant fails or refuses to make repairs which are required by this Section 4, the Landlord may make the repairs and charge the actual costs of repairs to Tenant. Such expenditures by Landlord shall be reimbursed by Tenant on demand together with interest at the rate of twelve percent (12%) per annum from the date of expenditure by Landlord. Except in an emergency creating an immediate risk of personal injury or property damage, Landlord shall not perform repairs which are the obligation of Tenant and charge the Tenant for the resulting expense unless at least fifteen (15) days before work is commenced Tenant is given notice in writing outlining with reasonable particularity the repairs required, and Tenant fails within that time to initiate such repairs in good faith. 4.4 INSPECTION OF PREMISES. Landlord shall have the right to inspect the premises at any reasonable time after reasonable notice to Tenant, to determine the necessity of repairs and/or maintenance. 5.1 ALTERATIONS PROHIBITED. Tenant shall make no improvements or alterations on the premises of any kind without first obtaining Landlord's written consent, which consent shall not be unreasonably withheld or delayed. 5.2 OWNERSHIP OF ALTERATIONS. All improvements and alterations performed on the premises by either Landlord or Tenant shall be the property of Landlord when installed unless the applicable Landlord's consent provides otherwise. 6.1 INSURANCE REQUIRED. Tenant shall keep the premises, including all buildings, other improvements and landscape, insured at Tenant's expense against fire and other risks covered by a standard fire insurance policy with an endorsement for extended coverage. The policy shall be written for the full insurable value, with loss payable to Landlord, and the policy or a certificate of insurance shall be delivered to Landlord and shall contain a stipulation providing that coverage will not be canceled or diminished without a minimum of thirty (30) days written notice to Landlord. Tenant shall bear the expense of any insurance insuring the property of Tenant on the premises. 6.2 WAIVER OF SUBROGATION. So long as Tenant maintains the insurance required by section 6.1, Tenant shall not be liable to Landlord and Landlord shall in no event be liable to Tenant for any loss or damage caused by fire or any of the risks enumerated in a standard fire insurance policy with an extended coverage endorsement, and in the event of insured loss neither party's insurance company shall have a subrogated claim against the other.